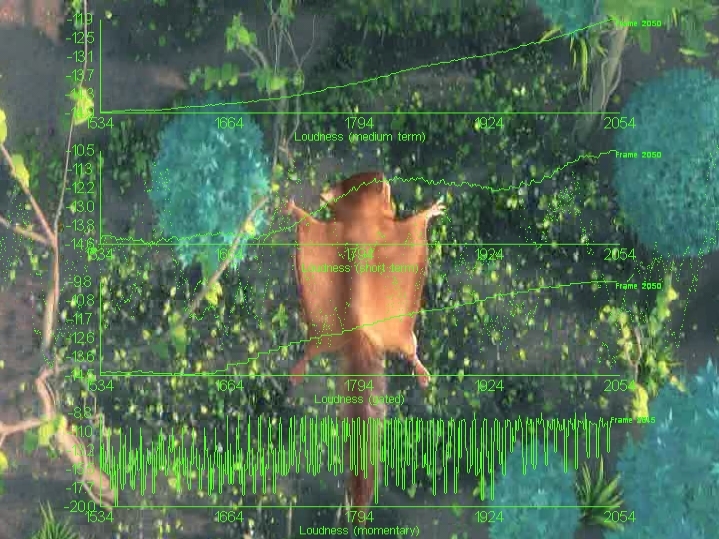 Monitoring of video quality, audio quality and loudness. Parallelisable. Borderless. Ideal to build video walls. Make your own opinion: evaluate Multi Audio Video Monitor for free! 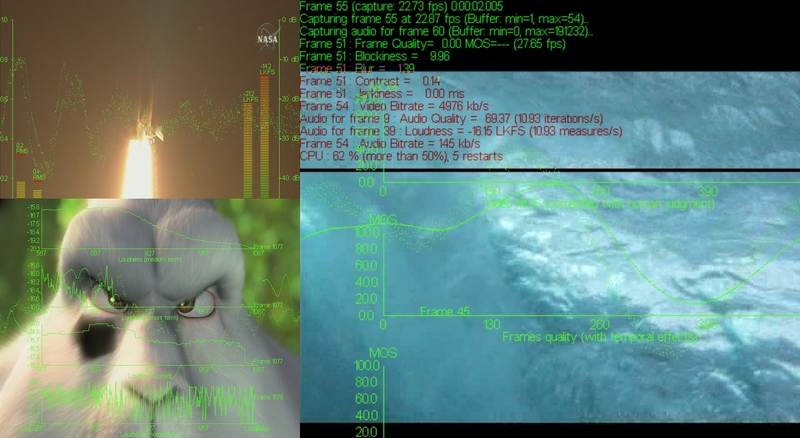 Multi Audio Video Monitor (MAVM) is a precise and very flexible solution to measure and monitor audio video quality perceived by end-users (also called QoE: Quality of Experience). 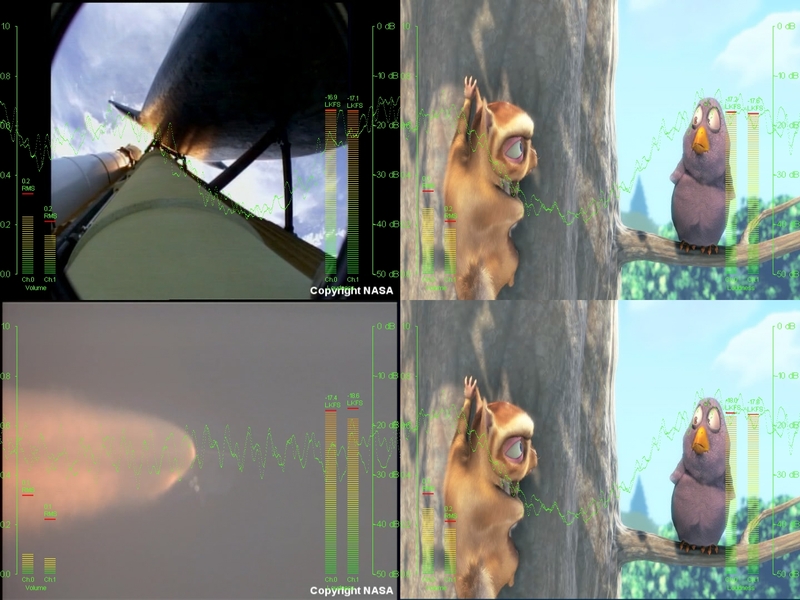 MAVM produces perceived video quality scores expressed on a MOS (Mean Opinion Score) scale. 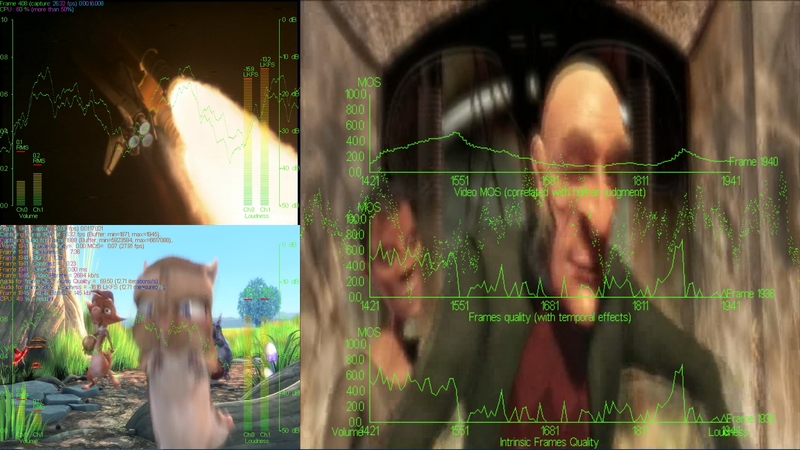 VQM's perceived video quality metrics are dedicated to HEVC (H.265), MPEG-4/AVC (H.264) and MPEG-2 video encoding formats. These video quality metrics have been optimized to produce quality scores which are highly correlated with human jugdments collected during subjective quality assessment tests in normalized conditions (ITU BT.500 and ITU BT.710). MAVM can process both IP streaming and files. MAVM uses "no reference" video and audio quality metrics. It means that when you want to measure the quality of a video, you only have to provide this video. MAVM is a software product. It works under any Windows version (XP, Vista, Seven, 8, 8.1, 10 and Server editions) and is easy to install (especially if you just want to use the no reference metrics, in this case you just have to run the installer and click on "Next..." several times). It can run on virtually any PC. It can even run on a laptop. If possible, the recommended configuration is: 4-core CPU or more, 3 GB of RAM, 10 GB of free hard disk space. 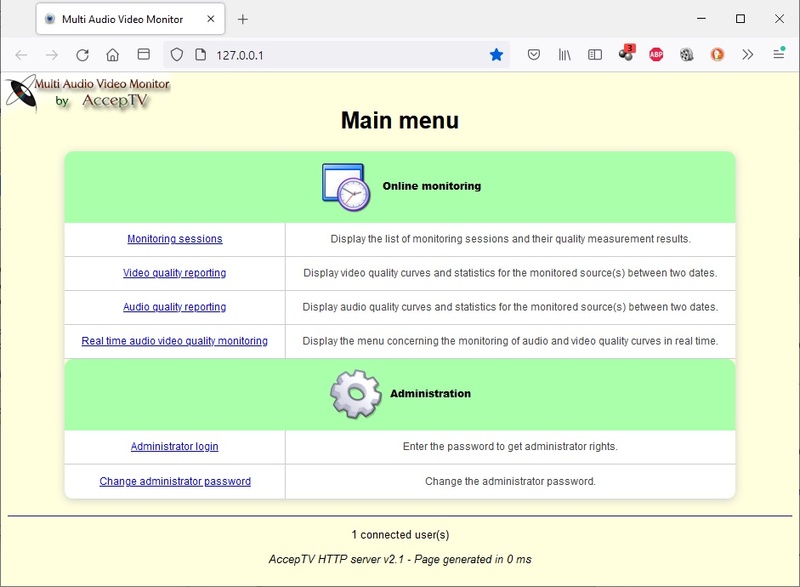 At start up, MAVM displays a small window which enables to enter the URL of the audio/video source (IP streaming or file) and run the monitoring. 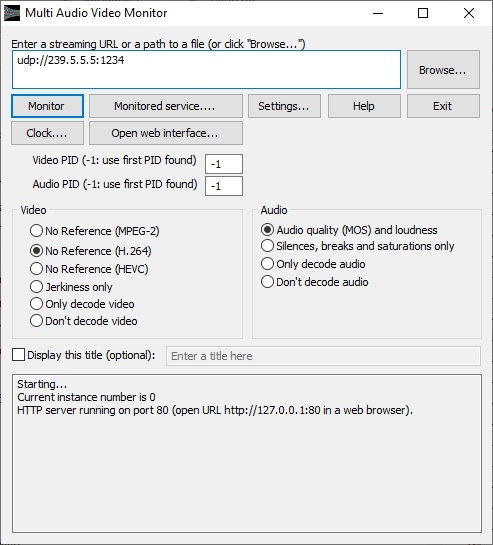 This window also enables to select the audio and video metrics to use. MAVM can also be run from command line, with many available parameters. For example, monitoring starts automatically at start up if you use the parameter "-autostart". 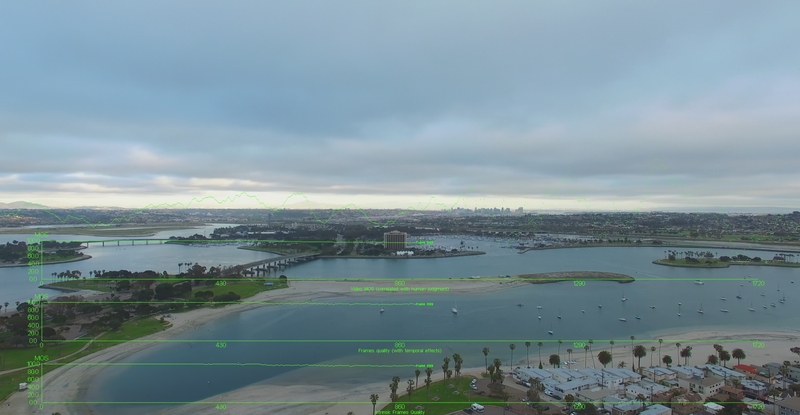 The videos can have any duration, any frame rate and any frame dimensions. MAVM also supports uncompressed YUV formats (4:2:0 planar, 4:2:2 planar, 4:2:2 UYVY, 4:2:2 YUYV, 4:4:4 planar). When you click on the "Monitor" button (or if you use the command line parameter "-autostart"), la surveillance de qualité démarre. Audio/video quality monitoring is performed in a borderless window, in order to be able to run several instances of Multi Audio Video Monitor in parallel. Every window of Multi Audio Video Monitor can be positionned and dimensioned with a precision of 1 pixel, in order to build a video wall (mosaic). Quality measurement uses multithreading. So the more CPU cores you have, the faster MAVM works. The measurements are made on the decoded audio waveforms and MAVQM supports the most common audio formats. Momentary loudness (denoted "M" in "EBU mode"): instant value of loudness. Short term loudness (denoted "S" in "EBU mode"): mean value of loudness over 3 seconds. Medium term loudness: mean value of loudness over 15 seconds. Gated loudness: mean value of loudness over 15 seconds, ignoring the values which are below two thresholds (first threshold is absolute and equal to -70 LKFS, second threshold is relative and equal to mean value of remaining loudness measurements after first thresholding minus 10 LKFS). Integrated loudness (denoted "I" in "EBU mode"): mean value of loudness over all the duration of the audio signal (even if the values proposed by EBU are recommended). Like the other measured data, all measured loudness values are saved and can be retrieved thanks to the web interface. MAVM can also trigger alerts if loudness is greater than a user-defined threshold. At last, the integration durations for short term, medium term and gated loudness can be modified by the user. In background, MAVM permanently saves its measures in order to be able to generate monitoring reports. These reports are available in MAVM's web interface. Indeed, MAVM includes its own web server. There is no need to install a separate server (like Apache): MAVM's web server is already fully included in the application. This web server enables you to connect from anywhere and get the measurement results, statistics, curves and even quality analysis reports (in several formats). To connect to the web server, all you have to do is opening a web browser (Internet Explorer, Mozilla Firefox, Chrome, Safari, Opera...) and go to URL "http://IPADDRESSOFTHEMACHINE" (replace IPADDRESSOFTHEMACHINE by the IP address of the machine which runs VQM). On the local machine (that runs VQM), you can use the URL "http://127.0.0.1" to display the web interface. By default, the web server uses port 80 but if you already have a server listening on port 80, you can change this port number. The first page of this web interface is the main menu which proposes different choices. In the web interface, the curves (of video quality, audio quality, loudness, bitrate, blockiness, blur, contrast, jerkiness, etc.) can be drawn between two user-chosen dates and times. The curves can also be drawn in real time, permitting to remotely see MAVM's monitoring activity. Thanks to its elaborate quality metrics and its design which enables it to run several times in parallel, MAVM is the ideal solution to monitor audio and video quality from several IP streams or several files. Its borderless interface enables to easily create video walls (mosaics) able to display measures in real time (as curves, levels or values).